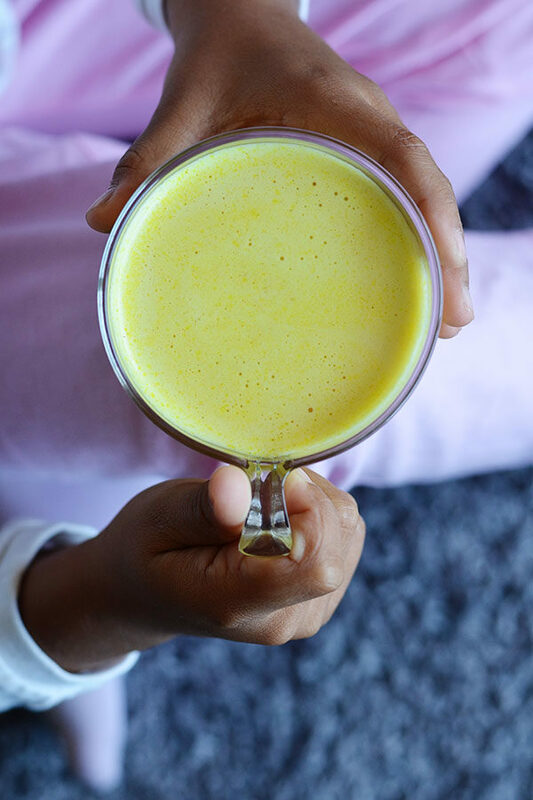 Golden milk is an ancient ayurvedic remedy that boosts your immune system helping to combat colds, cough, inflammation, joint pain and so much more. It’s so delicious even your kids will ask for more! 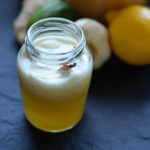 Last winter I shared my family’s natural remedy for cold and flu season so you should know by now that I am a sucker for natural remedies. 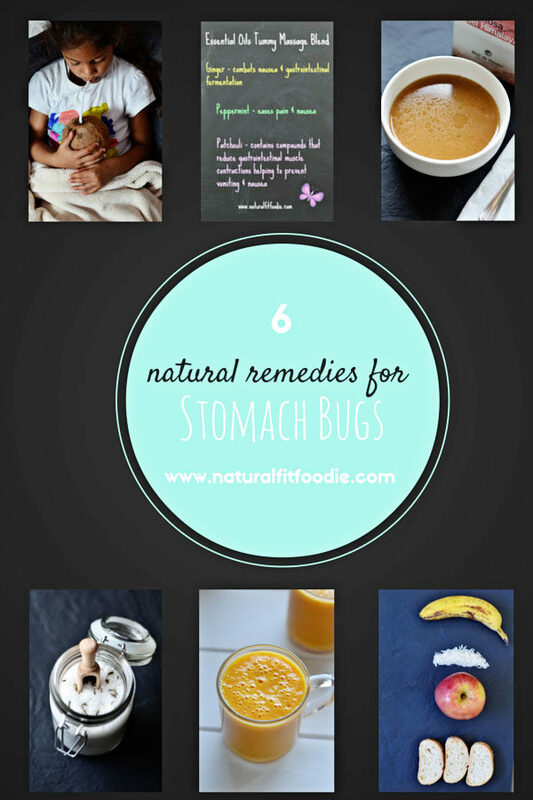 I even have a board on Pinterest solely dedicated to Natural Remedies which you should definitely check out. 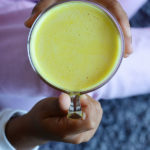 When I discovered golden milk, a traditional natural remedy made from turmeric and used in Indian households for cold and flu I just had to give it a try! I can report that it works splendidly! 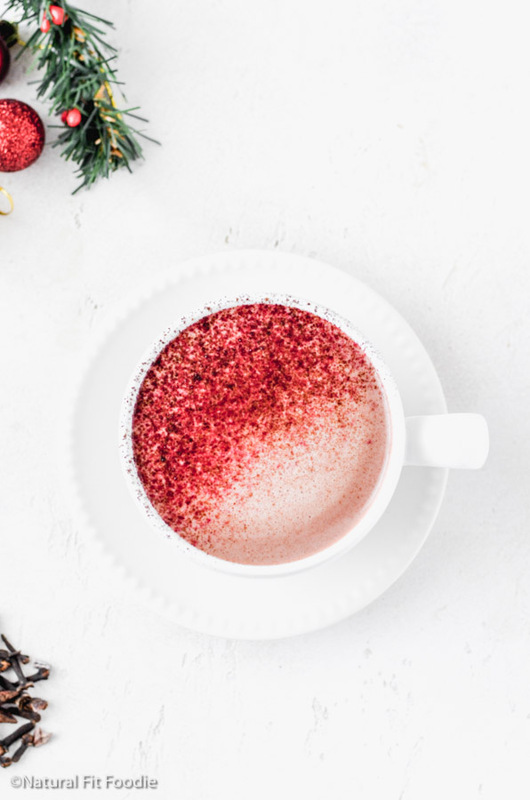 My family has been drinking both elixirs to keep those winter bugs at bay. 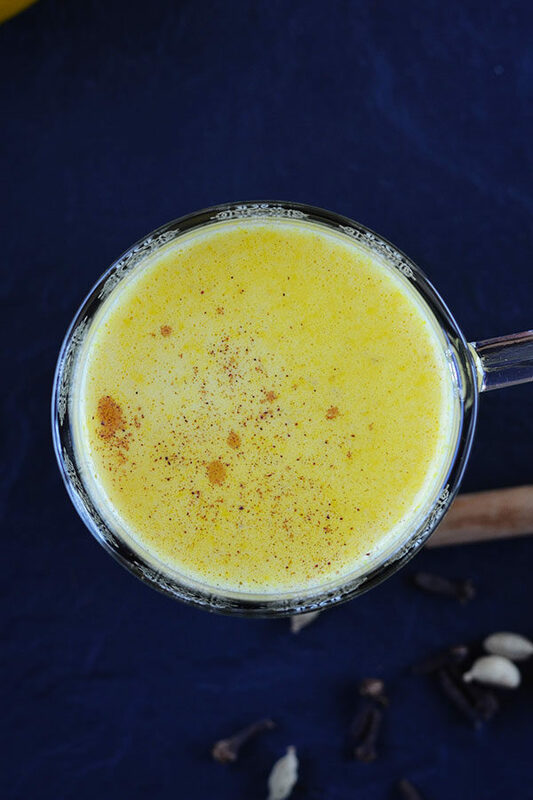 While discussing this recipe with my mom she mentioned that after giving birth to me her grandmother had her drink a cupful of turmeric milk daily. I was delighted to hear that! 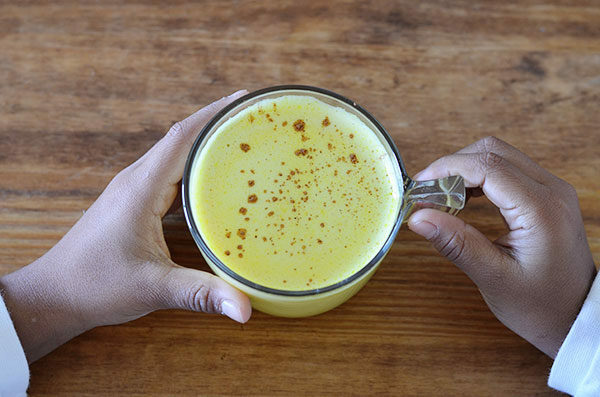 So you see Golden Milk isn’t some kind of new age hype or hippie remedy. This concoction has been around for ages and we can all be happy to pass this remedy down to our children. 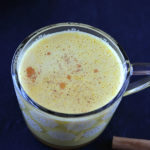 As an introduction to golden milk I suggest you try the simplest of golden milk recipes. That way you can see how your body reacts and decide if you like the taste. Combine 1 teaspoon organic ground turmeric root with ¼ teaspoon black pepper , 1 tablespoon of ghee or coconut oil and 1 cup of warm milk. My family has a glass of this golden milk elixir every night before bed so I have found it much more convenient to make a turmeric paste beforehand. In tinkering with this recipe I’ve found that I like my golden milk spicy. The spicier the better in fact. So I also add cardamom and cloves to my golden milk.These spices are optional but make for a golden milk with real ‘bite’. Add all ingredients to a small saucepan. Gently heat and stir to combine. 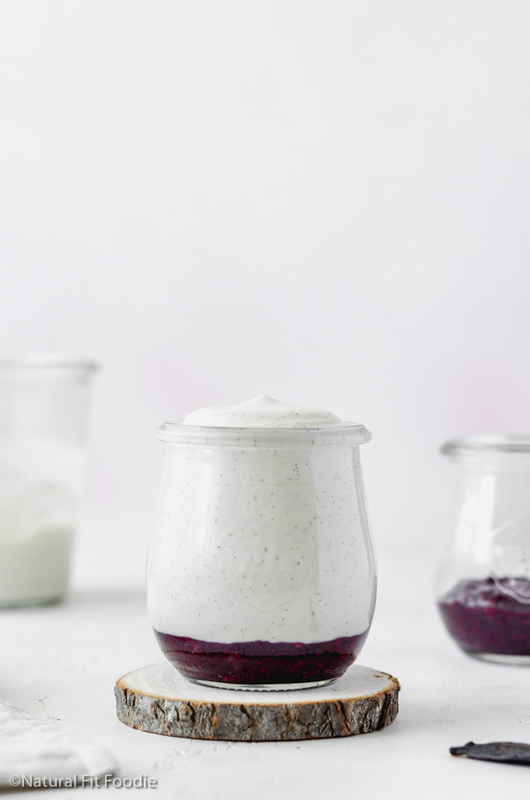 Love your recipe for this- so wholesome and yummy. I try to use turmeric here and there because it’s such a powerhouse, but I don’t love it. 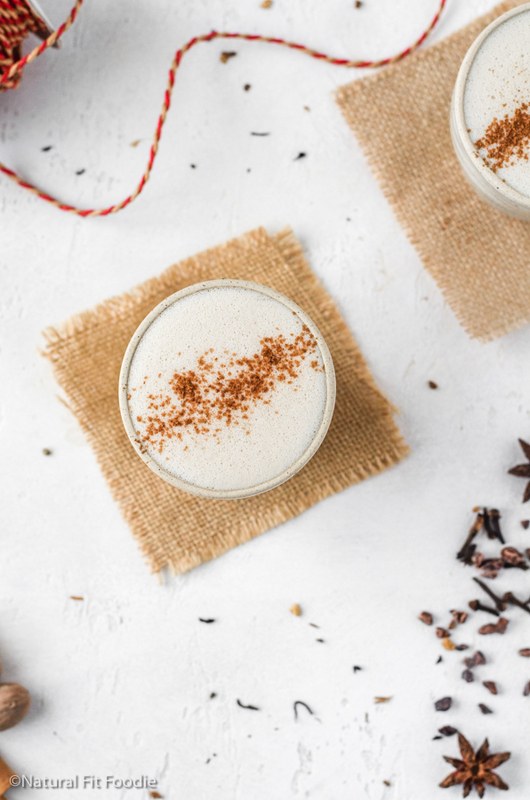 I love that you add other spices, too, to make a delicious, healthy beverage. That’s really good Susan. 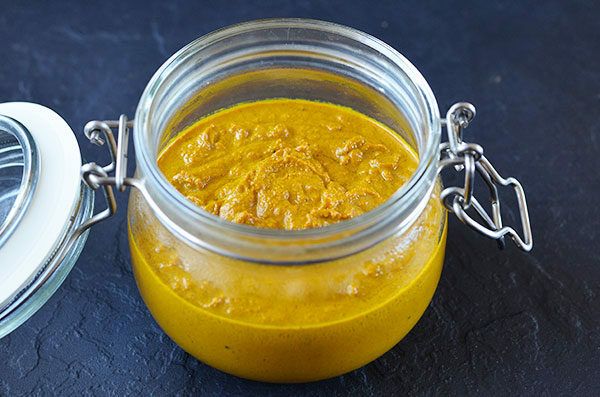 Turmeric does have a very pungent flavour but my family loves curries and Indian food so it stands to reason that we would also love turmeric. I have never used turmeric paste! Always fresh or powdered. I learn something new everyday! When you drink golden milk as often as we do the paste makes it so much faster. I’ve been adding it to smoothies and so many other foods as well. It’s great! I LOVE Golden Milk. Going to give your recipe a try, looks delicious. Hi Simi how old is your baby and what type of milk is he/she allergic to? When making the turmeric latte if we add a shot of coffee does this take away any goodness? Hi, if you have no issues (allergies, sensitivities etc) to coffee I don’t see why not. Can you use an immersion blender in saucepan out does it need to be a stand blender? Do you get the same frothyness? Thank you for sharing, I would love to try it with my girls, but I can’t find organic powder, what about using the fresh tumeric, I use it in Munich withorages and carrots. Would love to try the golden milk. Hi Hanadi, you can make the turmeric paste from ground or fresh turmeric and then use that for making the Golden Milk Elixir. I have been making the tumeric paste and forming small pill like balls then freeze them and take them like vitamins. i do this cuz I don’t always get to make the golden milk and the “pills” are so convenient.. I’m wondering if adding garlic might make it even more potent. Susan what a genius way to use the turmeric paste!